I have been flicking through this book (well, not this copy exactly) for months, in fact every time I visited the English Orell Fuessli in Zurich! Today, my patience broke and I bought it! I'm planning to open a bookring tomorrow, to celebrate my first week at bookcrossers! It's split into 4 main sections, each with chapters on various topics. Full of real life stories, explanations, and helpful ideas from a selection of mostly Swiss, German, American and English people and it really brings to life cultural differences. Importantly though it gives some meaning and background to the culture. Puts it all into perspective! There's some really interesting stuff on the differences between German, Swiss German and other languages. A must read if you've just arrived in Switzerland, or even if you've been here years.... If you're interested in european culture generally, specifically German and Anglo-saxon persepctives, then it's also well worth reading! 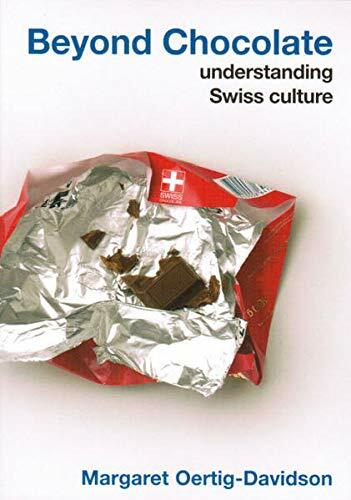 Welcome to my first ever Bookring: "Beyond Chocolate – Understanding Swiss Culture"
:-) celestewa / Australia --> Book is here! Look what came in the mail: my first bookring book! Thank you, nice-cup-of-tea. I'm looking forward to tucking in!! I had this book a week before I finally started reading it, and then read it in two days! It was so interesting I didn't want to put it down. I lived in northern Germany for nearly 10 years, so I could really relate to some of the things people had experienced and were saying. It was interesting to see in what ways German Swiss are different from their German cousins, but also from the other ethnic groups within Switzerland. The author spent some time researching and experiencing the Swiss culture (at least 15 years), exploring why they do the things they do. To a certain extent I had done the same in Germany, so I feel a certain kindredness of spirit, which you might not. However, this woman had the training, education, contacts and talent to act on her explorations, and this book is the result. An interesting insight to Swiss culture and an invaluable aid for anyone moving there to live and/or work. Starting as I was from a knowledge base of the country which was at a level of zero, I found this very interesting. Haven't been to Switzerland yet myself, but I will have to remember some of the points when I go there in the future. The chocolate was an excellent idea! Thank you! I only ate one, but had to stop myself from gobbling them all up! Apologies for the delay in sending on - had problems with those unreliable PMs. Should go tomorrow. Arrived safely today thank you kangaroo. Thank you for the chocolates Helen, I did the decent thing and put a rather crushed chocolate out of its misery. The poor thing looked like something heavy had been dropped on it and the decent thing was obviously to eat it. The rest of the chocolates have been hidden away from prying eyes and will be forwarded on with the book in due course. Swiss culture is quite different from many English speaking cultures and this book is the ideal handbook for an English speaker who plans to live in Switzerland, work for a Swiss company, or just has Swiss friends. Allegedly most Americans think that Switzerland and Sweden are very similar. Most British people expect Switzerland to be like the rest of Northern Europe, many other nationalities just don’t know what to expect of the Swiss. Before reading Beyond Chocolate my own thoughts were that Switzerland was a bit like Germany, but neutral, with cleaner streets and highly efficient public transport and good chocolate. I didn’t realise that there were clear geographical and linguistic distinctions between German Swiss, French Swiss and Italian Swiss. From reading Beyond Chocolate I can imagine feeling quite at home in a coconut country being a bit of a coconutty peach myself. Some people may dream of holiday homes or retirement in exotic climes, I’d quite happily plump for Switzerland. I will forward the book to MrsWren when she returns from holiday. This parcel had been sitting on top of my printer patiently waiting to be send so it would arrive for the 12th and yesterday I remembered that I had forgotten it. Popped in the post this morning, apologies for the delay. Caught a week or so ago on my doorstep ! Been without a computer so sorry this is late. Arrived whilst I was away on holiday so wasn't able to journal until now. Looking forward to reading this ( and chocolate tasting!). Thanks for posting mrswren. Sorry for taking so long to move this along. I actually read it almost straight away, but not having time to make the journal entry, put it away safe so that various human and animal members of the household couldn't get their hands/paws on the chocolates, then promptly forgot about it. Sincere apologies! I found the book really interesting and loved the insight it gave into cultural differences. It also gave me something to think about with regard to my European friends and acquaintances and how they might view our relationships. PS I also loved the chocolate!! arrived in the post this morning, thank you. my first task is which of the yummy choccies to choose! well, i think i'm a peach with a few coconutty overtones! a very interesting book, with a few insights on the british as well as the swiss. having a swiss-german mother, quite a few of the observations rang a bell. i haven't been to switzerland recently, but when i go again i will be looking at things in a new light. pming seaflower for her address. posted to seaflower this afternoon. It seems I forgot to make a note that I received the book Mid-December, which I'm really sorry for forgetting! As for the book, I loved reading it and it contained lots of interesting information. I haven't worked or lived in Switzerland myself, but I visited a friend who did. I figured this book would be really useful for me anyway, since I studied German at the university and am working as a translator, so knowing about the cultures in the different German speaking countries is important (an interesting). The book was well written and covered so many aspects of life, so thank you to nice-cup-of-tea for sharing the book! I have PM'ed the next person on the list, and will hopefully be able to send out the book soon/as soon as I receive the next person's address. Book has arrived safe and sound. In view of the prior entries, just wanted to add that I responded to sea-flowers PM on January 26 (the day she sent it). Most sincere apologies to all for the delay (especially those after me); I didn't realize that I had this book for so long!! Thanks nice-cup-of-tea for sharing this book and for the wonderful chocolate. Looks like had melted a bit at one point but still tasty. This book arrived a day or two ago along with the sweets. Yum. Thanks sqdancer for sending it. It's next on my TBR list. Finished this book a few days ago and will be mailing it off tomorrow hopefully. There was a lot of useful information in the book and most situations were very thoroughly covered. It would be a great book for anyone planning to move to Switzerland or for someone working there or doing business with a Swiss company. Thanks again nice-cup-of-tea. This book is now on its way to EMA375 by surface mail. Enjoy! Book arrived today but the chocolate didn't do to well! It was 117 degrees here on Saturday so you can only imagine how hot it has been! Thanks for sharing this book. I'm looking forward to reading it. Very interesting book! I love reading about cultures. I especially enjoyed this book because I spent some time in Zurich a few years ago. Great stories. Thank you for sharing. I should be able to get this book in the mail in the next day or two. "Beyond Chocolate" just arrived as part of a book ring that started last year (05). I hope to get to reading it soon. I am a little confused, as the ring list inside the book did not even have my name on it, but looking at the list on the book page, I think I'll reprint that and send it on, so the next person won't be too confused. The book and chocolate has arrived in Australia! I was amazed that both are completely in one piece. My boyfriend is eyeing off the chocolate, so wont last long!